If you have been following me on twitter you saw yesterday I tweeted like 5 times about how much I loved a little movie I saw called Sing Street. Today I did my youtube review and I wanted to tell you about it because it really is special. Sing Street is directed by John Carney who made Once and Begin Again. I enjoyed Once but wasn’t a big fan of Begin Again. You can read my review if you want. I felt the conceit was too similar to Once but not as good and the Kiera Knightley character was too pretentious. However, I have none of those problems with Sing Street. In fact, I like it much more than Once! To start with Sing Street is PG-13 where Once is a pretty hard R so that is a nice change of pace but I liked the characters and music more here than in Once. Anyway, let me tell you about the film. It is set in 1985 Dublin, Ireland and stars Ferdia Walsh-Peelo as Conor, a boy who is forced to change schools to a rougher part of town. He meets a girl named Raphina played by Lucy Boynton who catches his eye. She wants to be a model in London and isn’t going to school. To get her phone number he tells her he is in a band and that he needs her to be in his music video. At first as a cover he gets his friends together to form a band and slowly they become more invested in the project and he turns out to be a decent little song writer. He is encouraged and helped by his world-wise brother Brendan played by Jack Reynor. I loved their dialogue and relationship. It felt authentic and the way brothers really talk. You felt for Brendan and his missed opportunities and you also could tell how much he loved his brother (and maybe resented him a little too). Everything about this movie worked for me. I loved all the performances. Conor’s parents are going through a divorce and I thought that was handled very well. The relationship between Conor and Raphina builds slowly through the film and the friendship between all the band members feels genuine. And I loved the music! I have already downloaded the soundtrack and have listened to it many times. There are classic 80s rock songs and also original songs played by the band- all great! I loved the dialogue. It looks nice and I liked the story. I loved this movie. That’s all there is too it. Go see it! I saw it in an early screening and it isn’t currently playing by me but as son as it is I want to see it again. This week for the Hit Me With Your Best Shot series I got to click a big hole off of my movie-watching bucket list. Up until this time I had never seen a Akira Kurosawa film. I had certainly heard of him but had never gotten around to seeing one of his movies. Well, this week for Best Shot we were assigned Throne of Blood. This is perhaps the perfect introduction for me to Kurosawa because it is his telling of William Shakespeare’s Macbeth- a play I love. I do think going into watching Throne of Blood it helped me greatly to know the basic story of Macbeth. Otherwise with the subtitles flying by the screen I might have been a little bit confused. Plus, some of the actors look similar and are similarly dressed so it got a little bit confusing. Luckily I know my Macbeth and so it all basically made sense to me. It is of course the story of the Lord (this case General) who is given a prophecy that he will be King. With the encouragement of his power hungry wife he then orchestrates events to make sure that prophecy comes true. He murders the king and then proceeds to reign in a kind of mania of worry that his crimes will be found out. 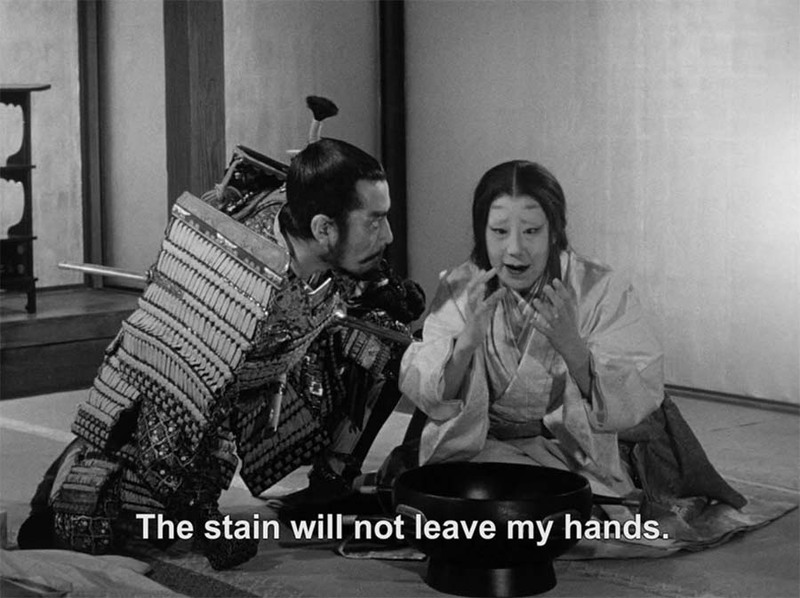 It’s all basically here in Throne of Blood. There is a little bit more of the mechanics of battle than you typically see in Macbeth but the basic framework is here. It was a creative technique having Miki’s ghost haunt him at the banquet before he knows that Miki is dead. 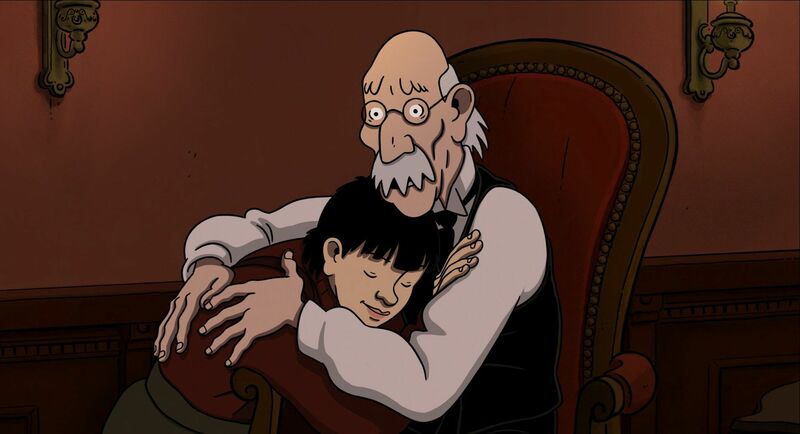 I also thought the scenes with Washizu and his wife Asaji were very strong. Washizu must declare an heir and is planning on naming Miku’s son but then becomes convinced to not do so when Asaji says she is pregnant. The baby is stillborn and so he is without an heir and Miku is dead. Miku’s son, however, escapes and later confronts Washizu and the great final scenes occur. My best shot this week is from the scene where Washizu finds his wife Asaji washing her hands from the blood of her sins. It is my favorite scene in Macbeth and they do it very well here. Most of this movie we are kept at a distance from the characters and emotion is portrayed through loud voices and expressions. However, here we can see their faces and I even think the subtitle says a lot. There are some movies that are saved by low expectations (and others like Hail Cesar that are hurt by high). Ratchet and Clank is one of the former. I had very little hopes it would be a good film. Video game movies are usually terrible and the first trailer was pretty mediocre. So, I went to the theater this morning hoping it would be bearable and you know what? It turned out to be a cute little movie. Is it a masterpiece? No, but I was entertained throughout and in the world of video game movies it is head and shoulders above the rest (I know not saying much but it is true). 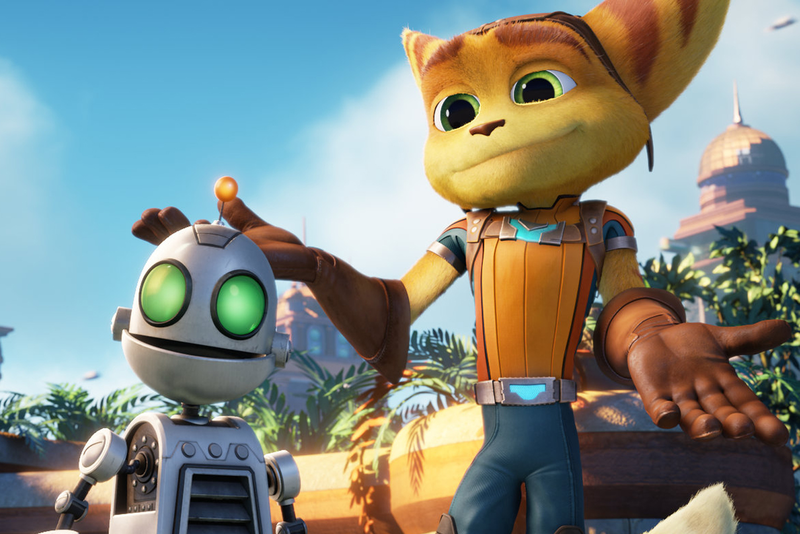 Ratchet and Clank is based on the video game of the same name which evidently had a reboot this week to coincide with the movie. I’m not sure what fans of the game will think of the film but I thought it was a cute little movie for kids. It kind of reminded me of Jimmy Neutron or the Buzz Lightyear Space Ranger shorts. It is about a lombax named Ratchet who dreams of joining the Galactic Rangers- a group kind of like the Furious 5 of KFP movies that protect the galaxy from invaders. 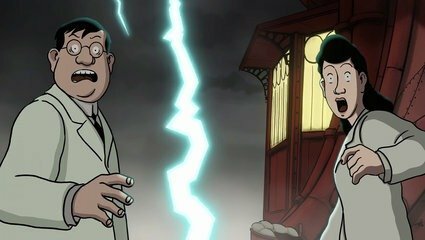 While auditioning he meets a robot named Clank and they end up battling an evil alien named Chairman Drek who is overseen by Doctor Nefarious. The humor is actually kind of self-aware and subtle. I was expecting a lot of bathroom humor like we got in last years Home but this was better than that. 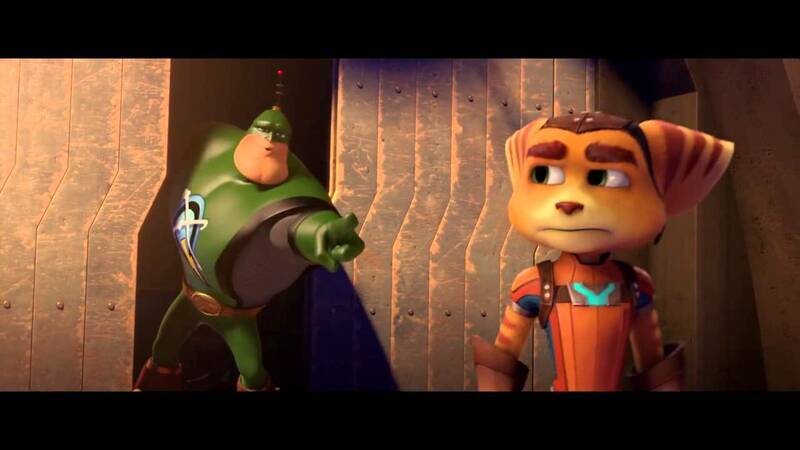 You also get to know the team of Galactic Rangers particularly an arrogant one named Captain Qwark who had some decent laughs. There’ s a nice heart to the film without it feeling forced and it clips along pretty well. I wasn’t bored and found the animation to be impressive for the small budget. I am sure some you wouldn’t see this unless you were dragged screaming and I get that but I honestly liked it much more than I was expecting too. It’s more made for kids and what I mean by that is there is none of the deep themes or emotions you get in a Pixar movie. This is just a fun little space adventure for kids. Nothing wrong with that. 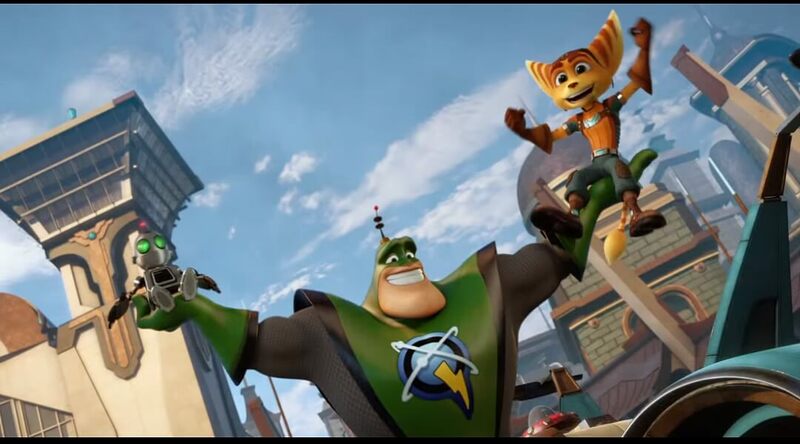 The vocal performances worked with some of the voices from the game including James Arnold Taylor, David Kaye reprising their roles of Ratchet and Clank. They also have Sylvester Stallone, Paul Giamatti, John Goodman and Bella Thorne. I also liked the music by Evan Wise. Overall it just felt like all involved were really trying to make something good and that they were having a lot of fun. I appreciate that. I don’t know how the critics will treat Ratchet and Clank. Like I said it’s not a masterpiece but for what it is, I thought it was entertaining. I think your kids will enjoy it and I’ve heard some game fans are liking it as well. It’s definitely nothing to be embarrassed by or miserable watching like Norm of the North. I’ve always been kind of intrigued by steampunk. The way the movement combines alternative history, fashion and art is so much fun. Unfortunately in the world of movies steampunk has fallen short with duds like Wild Wild West or League of Extraordinary Gentlemen. Most of the problem with these films is they are too much style over substance and they assume steampunk=bad campy writing. 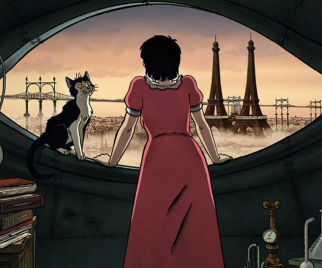 Well, April and the Extraordinary World is the first film I’ve seen that gets steampunk right giving us a true picture of what life would be like if things had never progressed beyond steam power. I was able to see April and the Extraordinary World early because I am working with Salt Lake Film Society to sponsor a steampunk costume event for the premiere on April 29 (may change to May 6. More info to come as soon as I hear more). 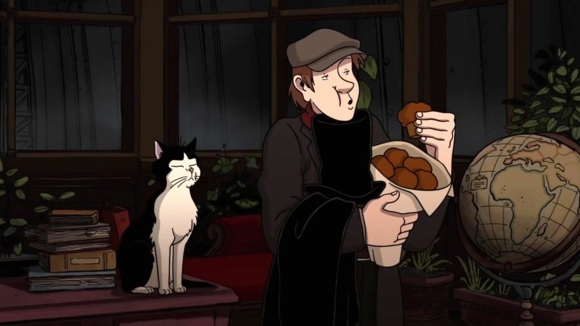 The films distributor GKIDS was kind enough to let me view the film and let me tell you guys- what a treat! 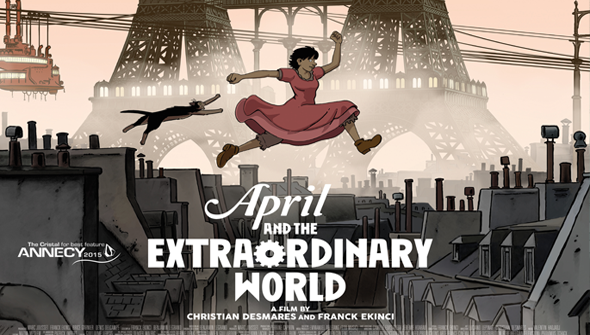 If you can make it down to the Broadway (or theater near you) and see April and the Extraordinary World please support this fantastic animated film. I won’t give too much away about the story but it starts out in an alternate history where Napoleon V is ruling France and since 1870 scientists have been disappearing (and hence their inventions are not invented). This keeps the world from moving past the age of steam and the trees are almost completely gone. Since 1870 a family called the Franklins have been studying a serum that has the power to regenerate life. The government is interested in the serum to make the ultimate invincible soldier but the family is resistant. 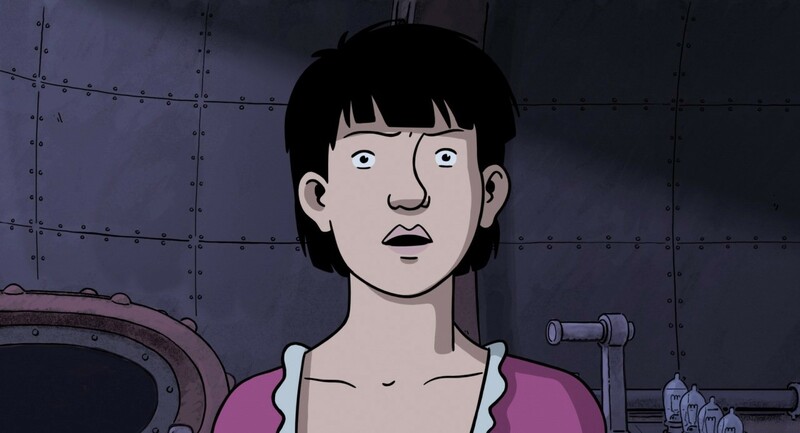 While April is a little girl her parents are followed and eventually end up missing. 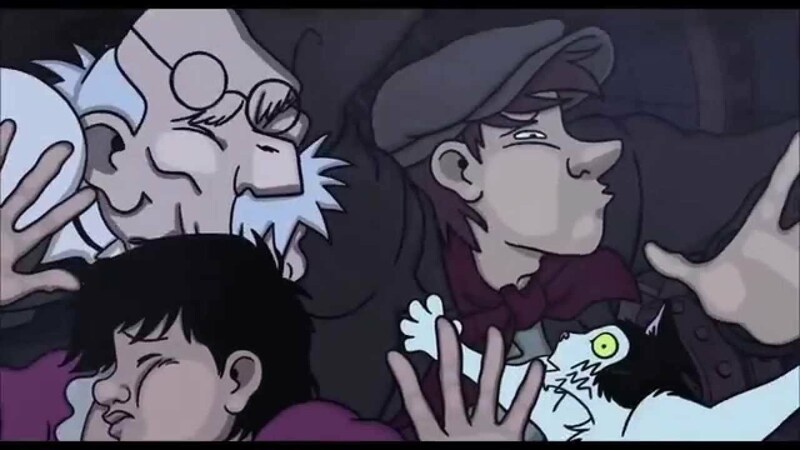 She is then forced to raise herself with her talking cat Darwin (another side effect of the serum is animals can talk). In 1941 she is a young woman who is doing her own research but the government has its eye on her. One day trying to get supplies she meets a young man named Julius who is intrigued by her strange ways. They are a marriage of convenience at first but turn into good friends. 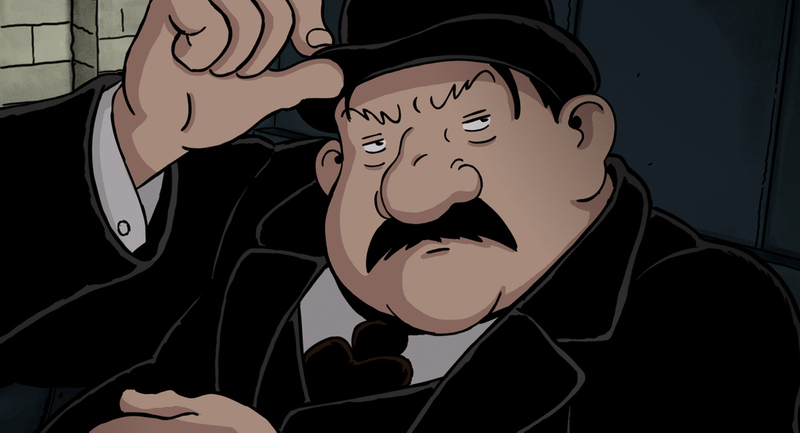 There is also a cop named Pizoni who is determined to capture the Franklin family if it’s the last thing he does, and April’s grandfather Pops who is sweet and nurturing as all grandpas should be. On the April and the Extraordinary World wikipedia page it describes it as a “animated fantasy thriller film” and that is very true. The greatest aspect of this movie is it kept me guessing and that’s what you want in a thriller. It was intense, different and absorbing. Aside from one liar reveal trope, I had no idea where it was going or how it was going to turn out. I love when that happens at the movies! The main conflict revolves around April trying to continue on the work of her parents while being hunted down and followed. Then when she discovers where they are it becomes more of a mystery (a huge part of steampunk). Along the way you get moving mansions, robots, coal and lots of steam. Fortunately there are also breaks in the action for comic relief particularly from Darwin, the talking cat, who is hilarious. There is some slapstick with the cops and other characters that didn’t quite work as well but those are only a few moments I could tolerate. There’s also a nice heart to the film particularly with April’s sincerity and real responses when interacting with Pops, Julius or Darwin. This is a girl you feel for and are rooting for. There are also smaller plot points that have heart like what happens with April’s father. You really feel for April and can sense her loneliness and even despair. The only aspect of the story I can see getting complaints is who the villain turns out to be. You’ll either go with it or think it is really strange. I went with it. 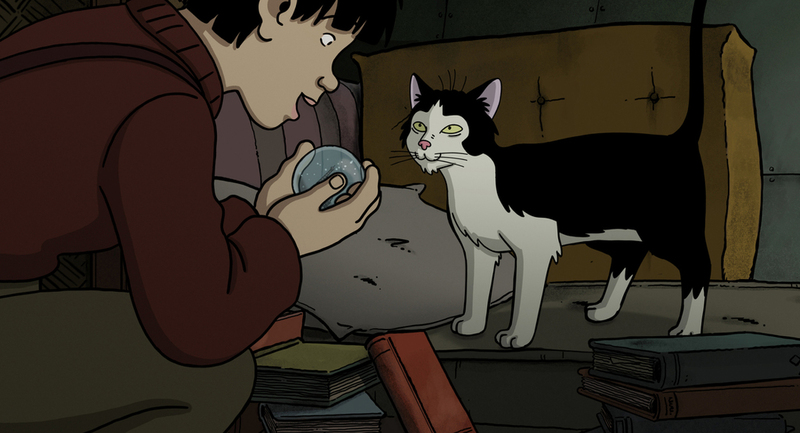 It almost goes without saying the animation based on Jacques Tardi’s graphic novel is outstanding. First of all, it is glorious to see such a well made 2D traditionally animated film, but it doesn’t coast on that. It is dark and cold but in a way that feels livable and real. The mixture of the sketchy characters with the black soot, white steam and red buildings stood out and was very unique. Something about it is gorgeous and haunting at the same time. Honestly the entire film is completely different and tough to describe but that’s what makes it so good. It’s surprising and strange and I had no idea what was coming up next. I have a feeling it is one I will like more with each rewatch. 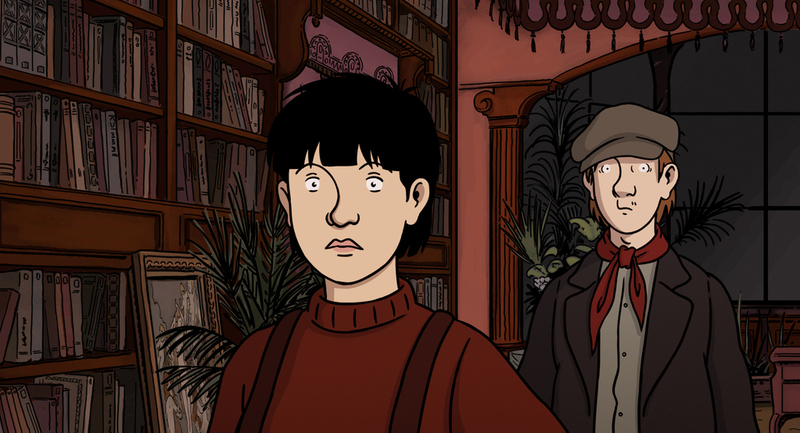 One reviewer described it as a mixture of Triplets of Belleville and Spirited Away and I can see what he means. 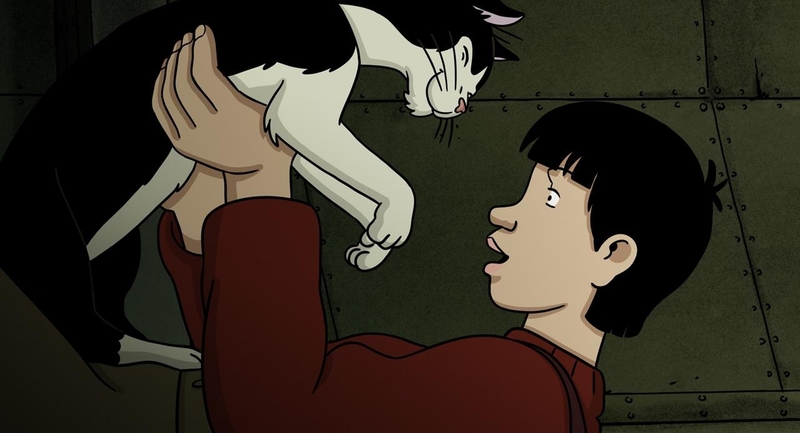 It has European surrealist sensibilities with the oddities and strong female lead of a Miyazaki movie. One of the coolest things about the film is the complexity of the characters. April is by no means a saint stealing repeatedly, Julius is a snitch, Mrs Franklin motivations are hard to pin down and even Darwin is a bit of a smart alleck. This makes them engaging to watch and unpredictable. I saw the French version with subtitles but the American cast does includes Susan Sarandon, JK Simmons, Paul Giammatti and Tony Hale. I’ve heard they do a good job. Whenever a film is this ambitious it isn’t going to be for everyone. Like I said, some people will think its strange, but I delighted in its oddness. And I like the way it will make kids think about their world in a new way. Fantasy worlds are great but here is an alternative version of their world. And it is not nearly as bleak or down-trodden as the barrage of dystopian films we’ve gotten of late. The closest thing I can compare it to is Madeline L’Engle’s A Wrinkle in Time. In fact, if your kids can handle the intensity and strangeness of that book they will be fine with April and the Extraordinary World. This is definitely a film to seek out and support if you can. Let your theaters know you are interested in seeing it. The more support we give these 2D films the more likely they are to be made! All in all, I loved it and can’t wait to see it again soon. Overall Grade- A+ (it may be my new favorite of the year. Still debating). If you get a chance to see it please put in the comments section. If not, does it sound interesting to you? What do you think of steampunk? I have a steampunk outfit ready to go for the premiere which was a lot of fun to put together! 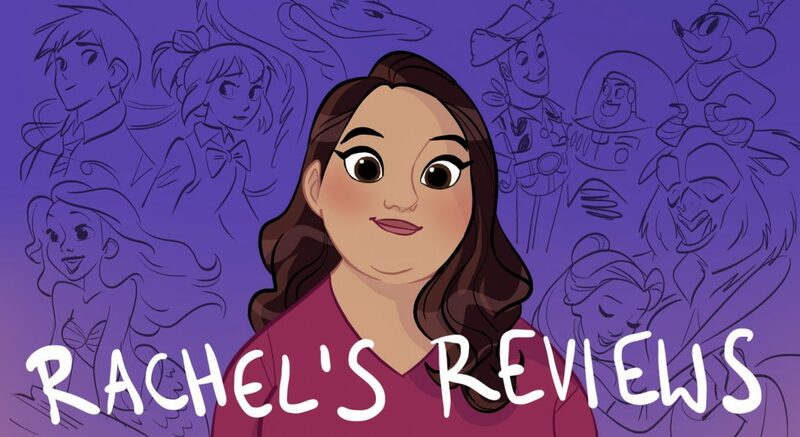 I had a blast participating in this roundtable on our favorite Disney animation. Check it out! Disney has been making animated movies from almost the start of film, they always seem to reach the right levels the audience love. Today we are picking our favourite Animated Disney movie without considering any of the Pixar films. For the next round we will be looking at our favourite Marvel Characters, if you want to take part in this round email your choice to moviereviews101@yahoo.co.uk by 1st May 2016. I just thought I would quickly share with you guys 2 videos I did this week that relate to Disney music. I participate as part of my youtube channel in a series called The Friday 5. This is where we get a topic and have to pick 5 songs for that topic. Well, this week the topic was ‘favorite Disney villain songs’. But I got confused and thought it was wild card week so I initially posted ‘favorite forgotten Disney songs’. Then realizing my mistake I went back and did a villain song post as well (these Friday 5 videos are pretty easy to put together). I am trying to use songs I haven’t already used on the Friday 5 so a few were out for that reason but I think I came up with good lists. For the Forgotten Songs it is more forgotten by general masses not Disney nerds who read this blog, so keep that in mind. The biggest pro is the world building. 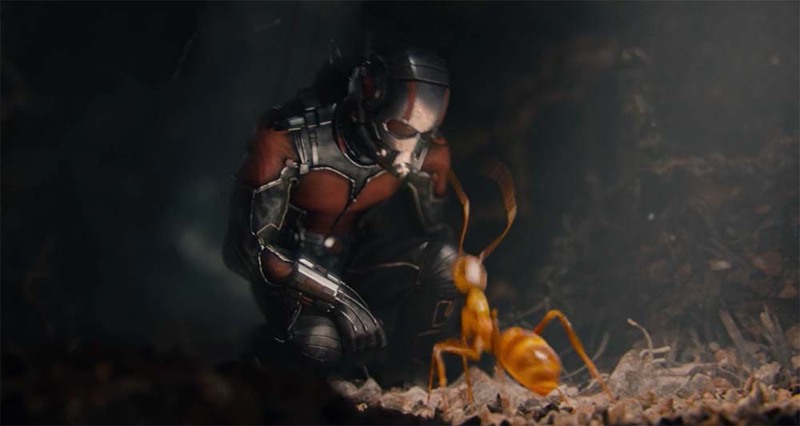 Especially in IMAX 3D it was such an immersive experience. I don’t think since Avatar I have been so immersed in a world at the theater. Maybe Gravity might be a good comparison. This is made all the more remarkable by the fact that it is all digitally created- down to the smallest blade of grass! Recently I have seen some terrible green screen work in films like In the Heart of the Sea or Gods of Egypt. Not here. There is no other word to describe the visuals but amazing. This is one to see on the big screen in 3D (which I almost never recommend). Trust me on this one. The voice talent is also all superb. 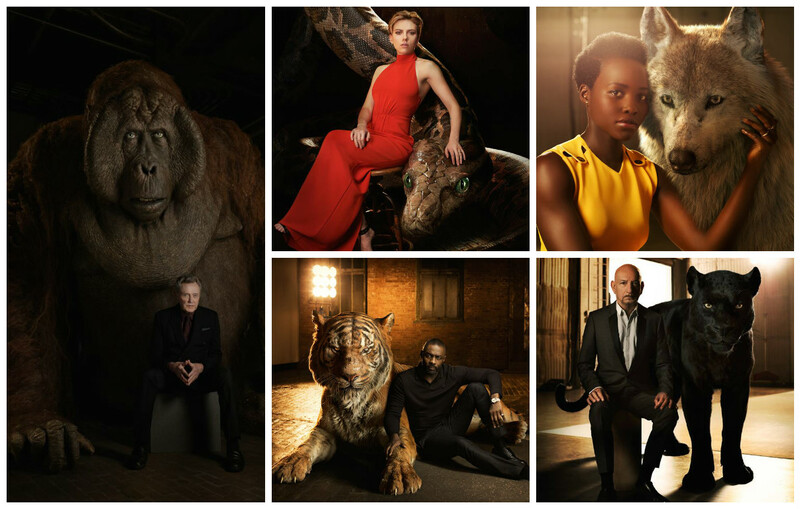 Everyone from Bill Murray as Baloo, to Ben Kingsley as Bagheera, and Idris Elba as Shere Khan nails their characters. It doesn’t feel like they are copying the iconic performances of the animated film either. They are their own characters both in the script and vocal performances. I also really enjoyed the darker take on the story because even though I love the original animated film I admit it I like it mostly for the songs. This is more accurate to the book and particularly the beginning and ending I was really engaged with the story. 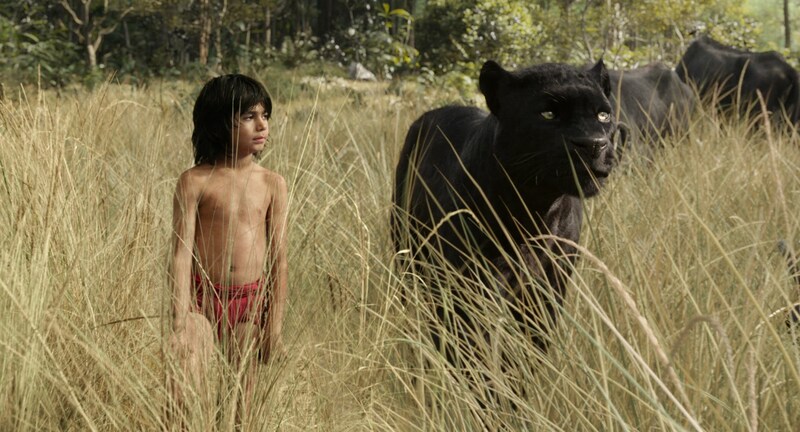 Mowgli is also a much more empathetic character (less whiny) than in the animated film. 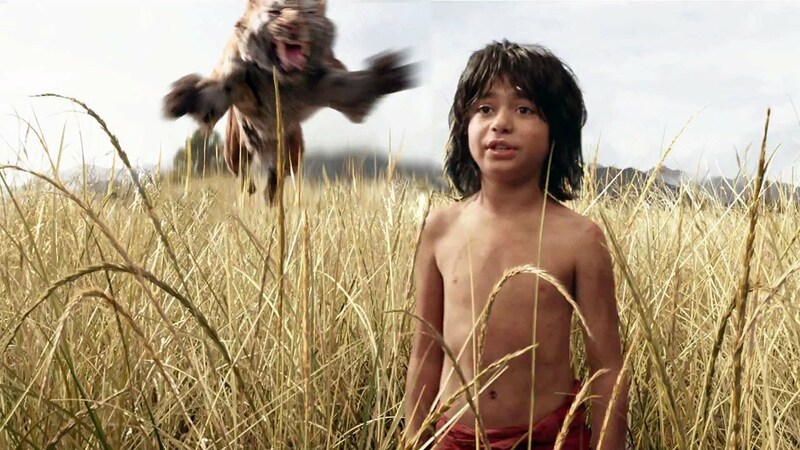 Speaking of Mowgli, Neal Sethi is excellent in the part. To think he did all his acting in a green screen room with puppets is remarkable, but even without that knowledge it’s a good, heartfelt performance. Now to a few things that didn’t work for me. Both times I saw the film I got a little bit sleepy in the middle. 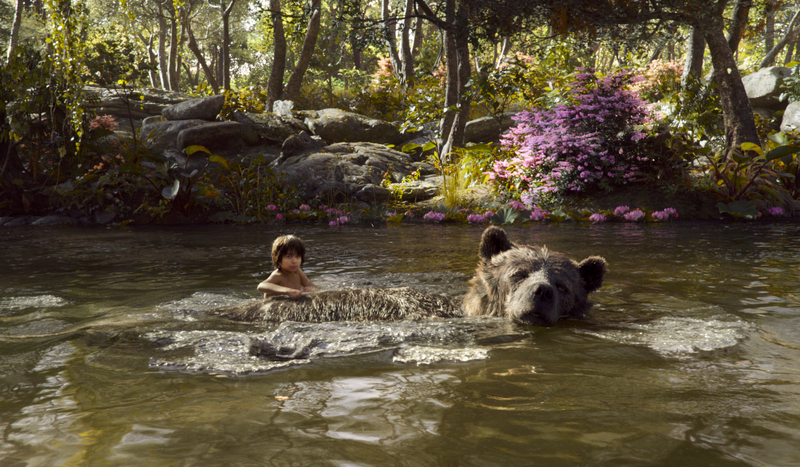 Particularly in the sequences with Baloo and King Louie. 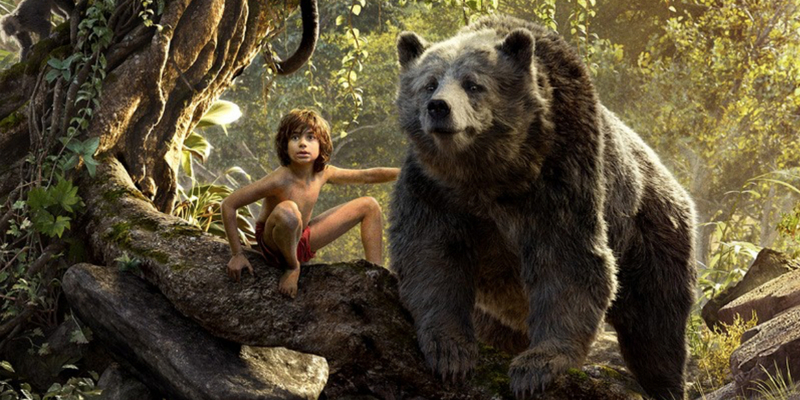 I loved Bill Murray as Baloo but just the story kind of stalled there. The King Louie stuff was almost one too many villains and he was a little bit too mean for my taste. He’s supposed to be a smooth talker and he’s more of a bully in this film. The other problem I had was in this section. This is where we get both of the songs- Bear Necessities and I Wanna Be Like You. I love both of those songs in the animated musical but in this darker version (especially with King Louie) it didn’t really fit to have them break into song. It kind of took me out of the movie to see them singing all of the sudden. The other concern is that it is very scary. I know the animated film isn’t perfect but at least it is something you could watch with your entire family. There is no way I could take my 6 and 7 year old nieces to this film. Shere Khan is very scary and attacks and kills characters. Louie is very scary and Kaa for her brief moments is scary. It kind of bums me out a little bit that it can’t be more of a family film but oh well. Finally, there will be some people who will be annoyed at some stuff that is missing. Kaa is only in the film for about 5 minutes. The elephants are briefly seen. No vultures or their cheerful singing. I am willing to forgive and accept this new version but that may annoy some purists. It might sound like I didn’t like the film which is untrue. I did like it. It was a magnificent experience, and I thought it was all done extremely well. But for me I still think Cinderella was better. It was more engaging from start to finish with no middle act lull. Plus, it was more consistent in tone throughout, and I just thought it was very magical. I also like that it is a family film that teaches a lovely message of kindness and courage to young girls. This film excludes those young kids because it is so scary. But for a visual experience and for something new I definitely recommend seeing Jungle Book. I think you will really enjoy it. You guys all know my feelings for Maleficent. It was my least favorite movie of 2014 and that includes Transformers: Age of Extinction…. This week in my youtube Disney Canon Project we are up to Sleeping Beauty, and I had several requests to review Maleficent. Well, I’ve already ranted about the film and declared it my worst of 2014 and so just harping on it more felt redundant. So I thought it would be cool to get another perspective. Thankfully my friend Emilee was willing to join me for a discussion of the film, which she enjoyed. She didn’t think it was perfect but she liked it. I think we ended up having a good discussion, and I can see things from her point of view. I still hate the film but at least I can see why it worked for her, and I think that is cool. I know a lot of you hate Maleficent too, but I hope you listen to another perspective and don’t just troll it. Anyway, it was a lot of fun to talk with a friend about movies even if it is one I don’t particularly care for. If any of you would like to join me for a discussion on a movie or have an idea for a future discussion let me know in the comments section.